HARTFORD, CT—Insisting there was still plenty left to eat, local party hosts Dana and Mark Randolph reportedly encouraged late-arriving guest Jonathan Morse this weekend to load up on food that had been sitting out in the sun for the past four hours. 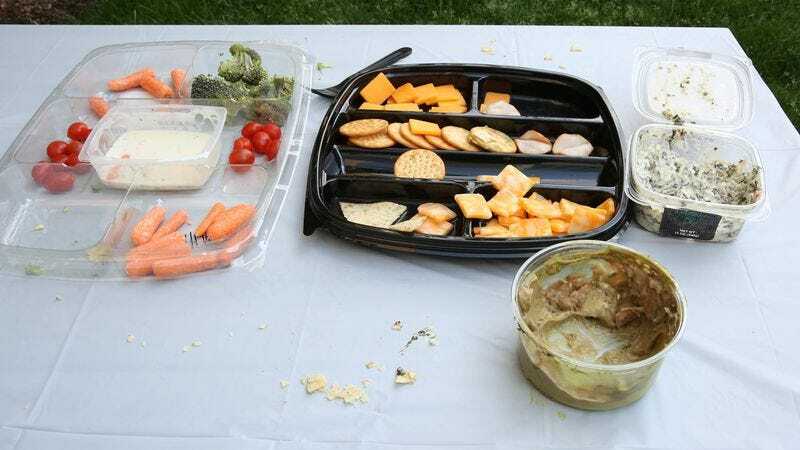 “We’ve got a whole spread, so just grab a plate and dig in,” said the Randolphs, pointing their guest toward a table filled with a variety of dried-out cheese slices, wilted salad greens, mushy coleslaw, and discolored guacamole that had been exposed to direct sunlight for the entire afternoon. “You definitely have to try Dana’s potato salad—it’s really good [and disgusting now], and there’s a few hot dogs left [in a cloudy puddle of hot dog juice]. Help yourself.” Sources later confirmed that Morse had fished a can of lukewarm beer out of a cooler filled with murky water.